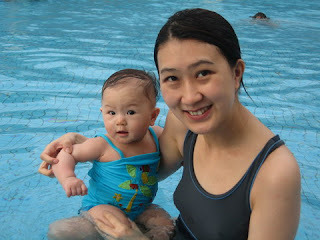 I redeemed myself by turning my "GRAND PLAN" into a reality - I took her swimming at the club today! I had trepidation before that : anticipating her to cry upon contact with the "cold" water, or cry after awhile especially when some water splashes onto her face. But no, she impressed me by taking to it like (as cliche as it sounds) duck to water! Good job, SW. Thanks also the 2 days of extremely hot weather here in PJ/KL. Bringing her to the pool today has been a good idea. 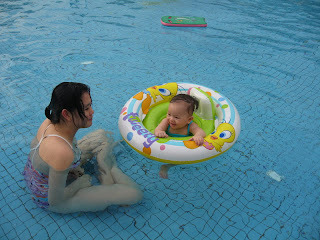 My sister and I had fun splashing about with her in the pool. When we put her into her float, she sat there without fear or crying out, and taking in the whole experience pretty well - infact, I think she was also busy observing the other kids' and babies's antics around her. I told her to "kick kick" (something which I taught her since young when I bath her). She responds by kicking her legs for awhile, then it's back to observing those around her. Overall, it was a good experience. 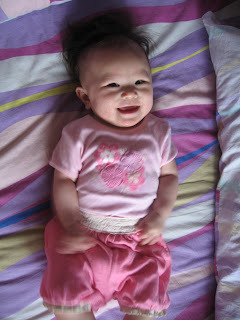 Shean Wenn slept in the car on the short journey home and woke up with such good mood! She played and laughed alot in the evening. I hope I can bring her for more swimming sessions before we head back to the UK! I must also add that her Huggies Swim Pants was EXCELLENT! It lived up to its name. I wonder how they design it?? Most interesting. 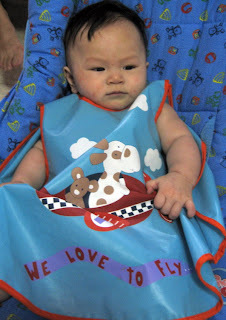 "I will bring Shean Wenn swimming almost everyday", I announced to the hubs before Shean Wenn and I flew back to KL. He protested slightly, "Isn't she too young? Isn't the water too cold?" "Are you sure she can swim at such a young age?" "What a worry wart! Of course she can swim. 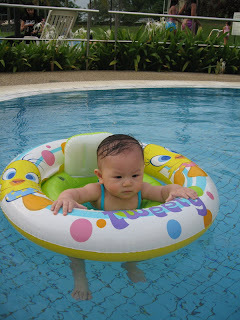 One is never too young to swim", I quipped and beamed. So I bought her a swimming suit. I looked everywhere for a suitable one. Bikinis or a one-piece suit? I opted for the one-piece suit afterall. I found it in Mothercare and it was on sale. I was happy, I tried it on her to see if it will fit, it did. 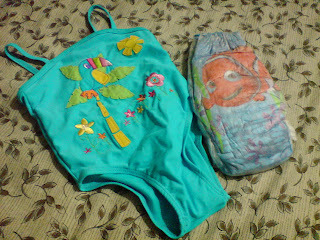 I even bought her the swimming diapers - those that will not soak up water and be bloated when she goes wading in the baby pool. All 12 of it in a pack. 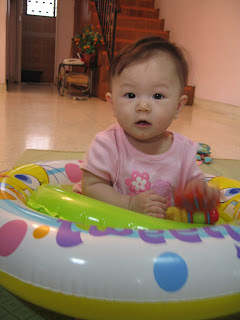 I packed them in the suitcase and waited to come back to warm and humid KL and jump into the pool with her. 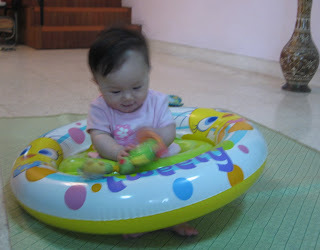 And 3 weeks ago, I even bought her a swimming float. Tested her out on her seat (it fits!). 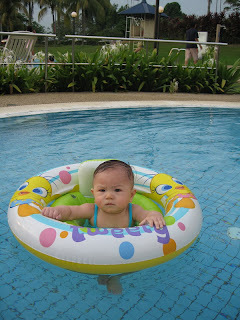 It's been one and a half months since we came back and the total number of times I have brought her to the pool : ZERO! I am such a "hero". 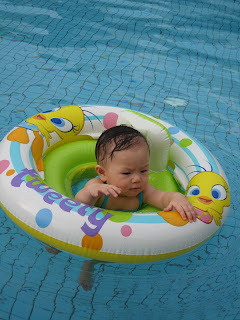 And look at how happy she is in her float. Now, imagine her in the pool in it. I think my husband need not worry at all about her being cold. With the rate I'm going, I hope to bring her to the pool at least once before we return! Or else I will need to think of what to do with 12 disposable swimming diapers. As you can probably tell, I don't even bother to remember which week is she now (ie, Week 28?). I'm all about the big numbers. 1. 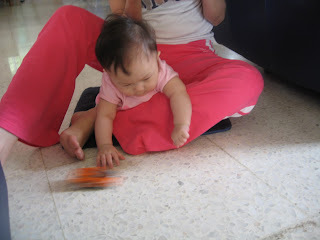 Scooting (almost crawling) : Front and backwards. She can also turn 360degrees to whichever direction that she wants, or if there is something she is reaching for - mummy, handphone, squeeky toys. 2. 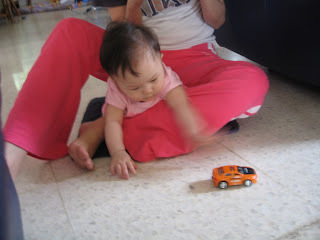 Playing : Last month, her fav toy was a remote control car. She loves looking at it move and trying to catch it. Many a times, she will catch it by it's "tail" (the antennae), somewhat like a cat catching a rat! Funny indeed especially when I see her lunging forward, left and right to try to grab the car. The kind people of BHP have also given me a remote control car (their current promotional contest) but when Tobey came to visit, I passed it to the chip-peas so that Tobey can play with it. I wonder if he likes playing with it? Or has he tire of it already? My first time bringing her to the Park. 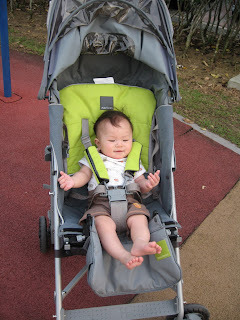 Look how happy she was, sitting in her stroller! Since I'm a paranoid android, I've already prepared ourselves for this walk, bringing along : water bottles (for me, and one for the baby), wipes, fan (for baby incase she gets too hot) and MOSQUITO NET! 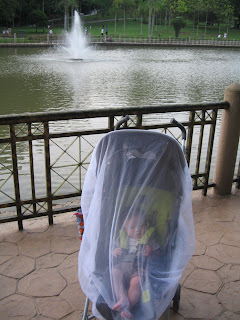 You should see the amount of heads it (the mosquito net) turned. Almost everyone would crane their necks to see what's the fuss? A man, jogged next to me and said "Don't worry, mosquitoes won't bite him (as usual, almost everyone who sees SW thinks she is a boy)". I replied unprovokingly without correcting him on Shean Wenn. He then added "There isn't alot of mosquitoes around anyway". AH HUH (who is he kidding?? Is this the first time he comes here? Gee! ), perhaps you're right, but I ain't gonna take the risk. I wanted to answer, but I thought I have no time to protest. Just jog along, you crazy man! My little darling has been eager to try out most of the food I cook for her. She has moved up from single-puree food, to double-puree food, to porridge now. (+8) Potato - She loves them. (+1) Carrots - So-so, I noticed if I put more carrots in her food, she seems to have a slight aversion to it, and not finish up. So lesson learnt : Put less carrots. 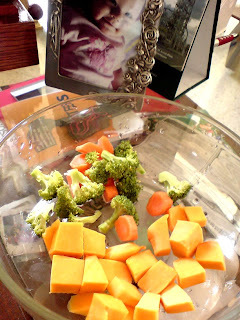 (+6) Broccoli - Ok with it! Thumbs up! Good girl, at least she did not learn from her daddy and not eat broccoli. (+10) Porridge - her absolute favourite is one cooked with ikan bilis (anchovies). The first time my sis TY made these for her, SW finished up ONE FULL Avent cup. I was so afraid she will be unconfortable. That day (her first day tasting anchovies porridge), she had 2 full cups of porridge (once for lunch and one for dinner). I decided to limit her intake the next few days... so she will not get too uncomfortable. I use all organic vegetables. Although the rice isn't so. The store I go to does not have it in stock when I went there last week. Will try again next week. Speaking of organic veges, there are 3 shops nearby selling organic produce. I love visiting two of them. One which has good merchandising standards - store is bright, well-stocked with interesting merchandise (they also have organic baby formula) - from groceries to non-perishables (candles and pots! ), and the staff are helpful! Another shop I like going to has a restaurant that sells vegetarian dishes, I want to try one day. And their staff is SO HELPFUL. Makes shopping experience a joy. Some of their vegetables are also imported - from Australia or America. The 3rd shop is totally clueless - they don't stock a good variety and have poor merchandising standards : their shelves are so "clinical" - white shelves with each product facing of 1 and stock-depth of 2 or 3 each. That is just plain bad merchandising. Also, their products are everywhere not according to categories. Pooh! Really shows how merchandising can help a store create that wonderful ambience. NEXT - Introducing fruits to her. I'm targetting Month 7 or 8, if I can help it. My youngest sis, TP had 2 of her friends over yesterday evening. Three eager and enthusiastic 19 year-olds working labouriously in the kitchen measuring and mixing flours, eggs and sugary stuff for some 2 hours. The end result? These! 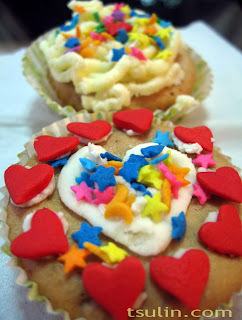 And the cupcakes taste just as good (or better) as it looks! It was one of the nicest cupcakes I've ever had : Not too sweet (because, seriously, alot of the cupcakes bought from stores are just atad too sweet). The fillings - with walnut, raisins and banana (some had chocolate chips in it)- taste good and not too dry, even after one night (I had some for breakfast this morning). 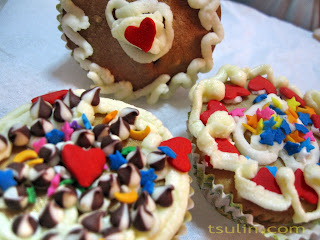 Their icing was yummy too, if you need that extra sweetness to your cupcakes. And to be perfectly honest, those beautiful trimmings on top - colourful shapes added for aesthetics - can probably be left out, less is best. 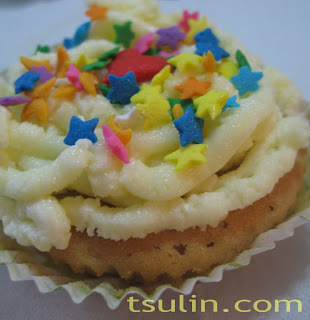 Still, they made the cupcakes look more appetising. ... Well, a NEW hairstyle, anyway. 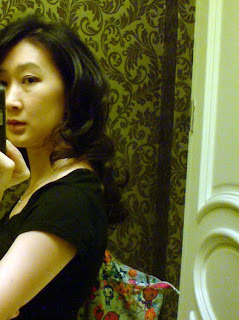 Another tick on my checklist while back in KL : to perm my hair again. 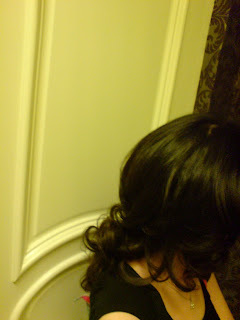 And who else to do it than JS, my hairstylist for the last 6 years? I called him up and he says he is now based in A Cut Above in Pavillion. I was dreading a drive there. But I thought, (and I was right) 1 Jan driving in KL should not be that bad. Afterall, the traffic should be smooth due to people sleeping in late after a really late night out celebrating New Year's Eve. Traffic was a breeze! I arrived at 1215noon. And found a carpark relatively easy. Met up with TK for a Jap lunch at Ichiban - which was quite good. But nothing compared to my fav haunt (which is no longer around) in London. Then, we went around killing time since my appointment is at 2.15pm. Went to Sincere Watches to ogle over watches (yet again). SIGH. I think my heart is pretty set on that watch.. but oh! Where am I to get funds? (**thinking really hard about any secret stashes of funds that i might have forgotten**) The "husband-sponsor" fund is like prying a catch off an eagle. So, no. Cannot go to the hubs. He has also moaned several times that why should I get a watch more expensive than his? But oh, how many times must I explain? I usually do not buy things at whim. To me, if i want to get something like a watch, I will only buy something that is very valuable - I do not believe in getting many (cheaper) watches. I will only buy ONE (more expensive) watch. And besides, a good watchmaker's watch is an investment. The only watch that I bought was in 2001, using my first bonus. Although it is not a "watchmaker's" brand, I do treasure it because it serves as a reminder of how hard I worked, and how happy I felt when I got my first bonus! And as I gradually went up the ladder (eventhough it was a short stint of working :P) .. and my taste grew more "expensive"... my new aim is a good watchmaker's watch. And I know I will not get another watch for a good number of years. So, after 5 hours of bum-numbing sitting position, I finally walked out of A Cut Above feeling really happy (and tired). Very well-deserved treat for myself too. They are having 20% off all haircuts/perms (excluding wash and style, i think). JS has suggested some highlights. But oh, I still stand firmly on not wanting to "damage" my hair like that. But no, yesterday I might have a change of heart. I think I'm now swaying. In my mind even as he was speaking, I was contemplating - red or gold, red or gold???? (The two colours are for the "lack" of the metal and fire elements in the new Rat Year) Argh. And how did I celebrate New Year's Eve? This year (as with the past 3 years), I spent it just like any other ordinary day - as the clock strikes 0000 2008, I slipped into bed, almost dozing off... with the fireworks lulling me to sleep.